Environmentally friendly Printed Carrier Bags. 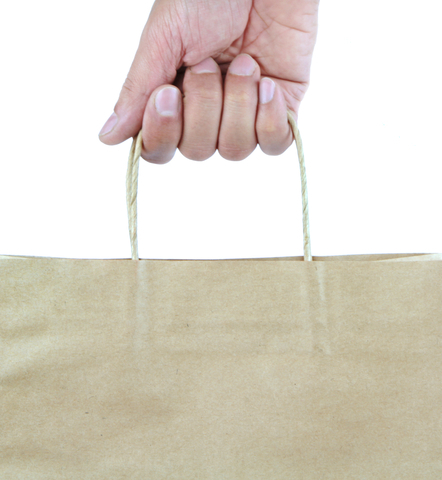 Chose from our range of kraft or white twisted paper handle carrier bags (which are manufactured from sustainable and renewable raw materials) or from our plastic degradable range which start to break down gradually when initially exposed to UV light (without strength being compromised). CARRIER BAG PAPER TWISTED PAPER HANDLE Standard ink colours. Inclusive of Printing Plate Charges. 100gsm Kraft or White Paper Handle white or brown. Standard Ink Coverage. Delivery lead time approximately 3 weeks from receipt of approved artwork. Prices quoted exclusive of delivery to UK Mainland but exclusive of VAT at prevailing rate at date of invoice. Printing plates are currently free of charge for a simple design (subject to sight) covering no more than 50% of the bag surface (line work only). Customer to supply ready to go vectorized artwork in Illustrator or equivalent with any text outlined. All prices quoted in Pounds Sterling. Delivery lead time approximately 4-5 weeks from receipt of approved artwork. Current prices based on standard ink coverage of 50%. Any other requirements please contact us. Manufacturing tolerance plus minus 20% against quantity ordered. Origination and printing plates chargeable extra at part cost subject to sight of artwork.